It took 236 hands and nearly 14 hours before Jamie Gold finally claimed all 88 million chips in play to become this year’s WSOP Main Event winner. In terms of time and number of hands, this year’s final table was similar to 2005, when Joe Hachem also needed nearly 14 hours (and 232 hands) to take the bracelet. Unlike last year, however, when the chip lead changed several times and the eventual winner was short-stacked for most of the night, Gold dominated throughout. His performance will undoubtedly inspire much analysis and talk of “playing the big stack” -- something Gold obviously did successfully as the chip leader for the last five days of the tournament. Gold came to the final table with 26,650,000 chips -- about 30% of the total chips in play and about 9 million more than his nearest competitor, Allen Cunningham. He demonstrated aggression from the start, taking five of the first 11 hands (four without having to go to showdown). After three hours Gold had built his stack to 33 million, knocking out the first two players in the process. An hour later Gold went over 50 million after eliminating Richard Lee in what appears to have been a pivotal hand. Lee was second in chips with approximately 16 million when he decided to put them all in the middle with . Unfortunately for him, the one man at the table with more chips held . The board came , and Lee was on the rail. Around 2 a.m., Gold knocked out Cunningham in fourth place. Around 3 a.m., Gold dispatched Michael Binger in third. And after seven hands of heads-up, Gold took out Paul Wasicka around quarter ’til four. In the end, Gold eliminated seven of the eight players at the final table. I didn’t pony up the 25 clams for the pay-per-view broadcast, but I am curious to find out how many did -- and how much those who did enjoyed what they saw. Given Gold’s dominance throughout the night, it may well have been less than exciting to watch. Still, it had to be marginally more fun than purchasing a heavyweight fight that ends with a first-round knockout. Lasted longer, anyway . . . . Given Gold’s huge chip lead throughout the night, the idea of cutting a deal could never have been genuinely considered. When heads-up play began, Gold had nearly an 8-to-1 chip advantage over Wasicka -- not the sort of scenario that would lead any sane chip leader to commit to a deal. As far as Jamie Gold’s reluctance to be the “ambassador” of poker goes, I think it should be understood that winning the bracelet need not require one to fill any particular, Miss-America-type diplomatic role. 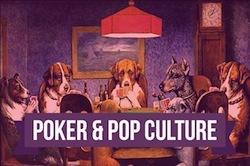 (The hosts of CardPlayer’s The Circuit smartly addressed this topic during last night’s episode.) Whether Gold stays in the spotlight or hides away in relative obscurity ultimately will make little difference to the industry as a whole. He needn’t feel it necessary to live up to the “standard” established by Moneymaker, Raymer, and Hachem, nor should his actions over the next year be regarded as any “standard” for future winners to follow. No, the true “Gold standard” -- that which should prove genuinely influential at the tables in the months to come -- is the man’s play last night and throughout the Main Event. For that he’ll be both celebrated and looked to as a guide by the many who hope to follow his successful path. 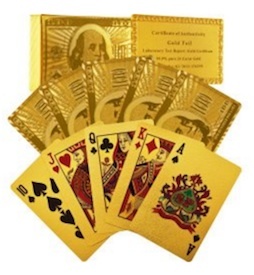 Image: Trademark Poker 24k Gold Playing Cards, Amazon. 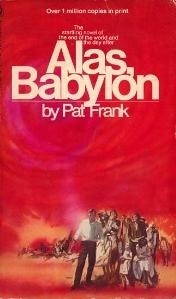 u should have surfed around and done what 90% of 2p2ers did and watch it on a hijacked link. Thanks, Andy. I'd seen that & considered checking it out, but couldn't have stayed up for much of it, anyhow. How was it? I think If i could be anyone else in the World, It would be Mr Gold.